I hope you’ve had a wonderful holiday season and the New Year has started out well for you. Here at the Memorial we are diving right into the New Year with a three-part lecture series beginning January 29, 2015. 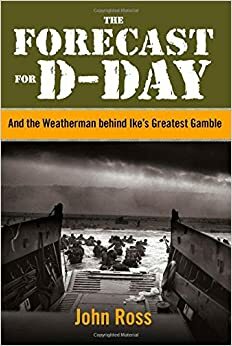 The first of the three lectures is called, “The Forecast for D-Day: The Weatherman behind Ike’s Greatest Gamble”. If you have ever wondered just how much the weather changed the course of history during the war then you must join us at the Welcome Center at noon. As you may already know, the Allied Expeditionary Force experienced less than ideal weather conditions on June 6, 1944. The seas were rough and stormy, the sky grey and foggy. While the men were aided by the grey cover, the seas roughed them up to the point of sickness. But those conditions were better than the ones they would have faced the day before on June 5, the original landing date. Author John Ross narrates the captivating history of how an entire invasion could be moved by twenty-four hours and the outcome of such a decision if proven faulty. The lecture will be held in the Welcome Center at 12 PM until 1 PM. There will be a slide presentation and open discussion afterwards. Admission is free, but donations are appreciated.